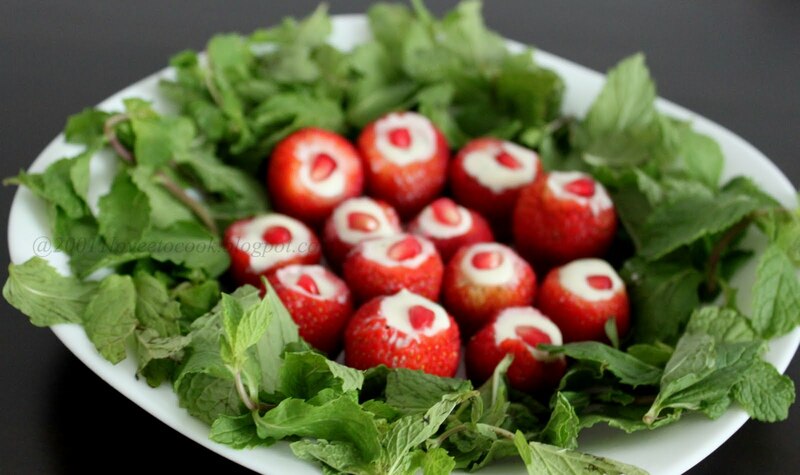 Just another reason to savour the beloved strawberries and cream :) This miniature version is sinfully denser and decadent with mascarpone in the limelight. A fun no cook dessert to make with your kids or a versatile one adding the oomph and the chic to your distinguished dessert platter. We loved it and so did our new friends on dinner. A must try for all of u definitely. Take all the ingredients except the berries and garnish , mix till smooth. The honey will dilute the consistency of the cream slightly. Place in the refrigerator and let it thicken. In the meantime wash and pat dry the strawberries, picking the top and scooping to create small pots to fill. Slice the bottom of the berries just enough so they are stable on your serving platter. 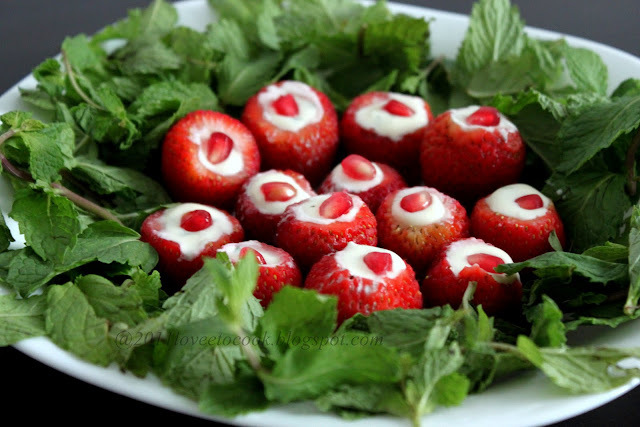 With the prep in place, fill all the strawberries with our prepared mascarpone cream and garnish with a pearl of pomegranate. Place these prepared pots in the refrigerator to cool for 30-35 mins and serve. I wanted my guests to see what they are about to eat and so a bunch of stemmed mint leaves on the plate came handy for garnish. That is a colorful, healthy and yummy post! Nice one! Wowww.. looks so cute and tempting.. love the idea and presentation !! quick n colorful.. will surely try this one..